Will SpaceX Stock Hit the Market in 2017? Subject: Will SpaceX Stock Hit the Market in 2017? Editor's Note: This article was updated on March 31 following SpaceX's historic launch and landing of its reusable Falcon 9 rocket. The debut of SpaceX stock has been highly anticipated ever since the company launched its Falcon 1 rocket on Sept. 28, 2008. 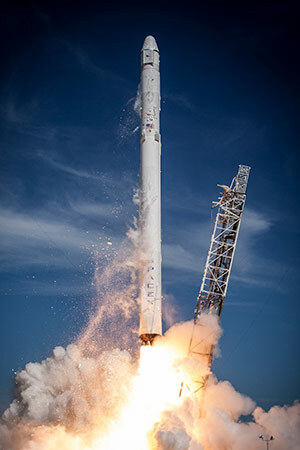 On Sept. 28, 2008, SpaceX successfully sent the Falcon 1 into orbit around the Earth. This made SpaceX the first private company to launch a vehicle into orbit – a milestone that stoked big financial interest in Elon Musk and his company's future. According to TechCrunch's CrunchBase, SpaceX received $45.5 million in funding over two rounds the following year. But since then, the aerospace startup has seen its fair share of successes and failures. One major win includes the company being the first aerospace firm to ever launch and land a reusable rocket on March 30. But the company's busts include several high-profile launch failures over the years. The company's recent track record begs one huge question: Will SpaceX stock hit the market in 2017? Officially called Space Exploration Technologies, SpaceX builds and launches rockets and space transport vehicles. The company has a long-term goal of making space transportation affordable. It also wants to eventually colonize Mars. The ambitious vision is pioneered by Elon Musk, the prolific entrepreneur who's also the CEO of Tesla Motors Inc. (Nasdaq: TSLA). He ultimately wants his interplanetary vehicles to send people to Mars for cheap. The implausibility of this goal is exactly why Musk says he wants to achieve it. "SpaceX is like Special Forces… we do the missions that others think are impossible," Musk says on the SpaceX website. "We have goals that are absurdly ambitious by any reasonable standard, but we're going to make them happen." Wired reported last September that Musk loosely estimates a single ticket to Mars right now would cost roughly $10 billion – equal to buying two blocks of property in Midtown Manhattan. But he wants to reduce it to $200,000 – equal to a two-bedroom home in Madison, Wis.
SpaceX has worked toward this goal by achieving several milestones for a private spacecraft company. Along with being the first private firm to launch a spacecraft into orbit, the company successfully launched and landed part of the Falcon 9 model on a ship in the Atlantic Ocean last April. That marked the first-ever rocket landing at sea. From April 2016 to August 2016, SpaceX repeated that success four times over. From 2006 to 2016, five high-profile rocket launches failed due to explosions or malfunctioning. In September 2016, the Falcon 9 model exploded in Cape Canaveral, Fla., before even lifting off the ground. The blast was reportedly felt miles away and was initially described by Musk as "the most difficult and complex failure" in SpaceX's 14-year history. Despite these recent setbacks, investors are still clamoring for shares of SpaceX stock. After all, the company has been one of the most valuable private companies in the world for more than five years now. 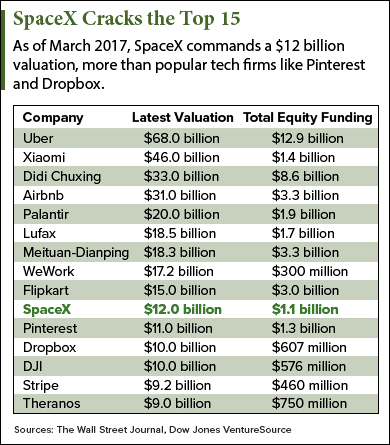 According to The Wall Street Journal, SpaceX is valued at $12 billion. That makes it the 10th highest-valued startup in the world, behind e-commerce firm Flipkart and ahead of social media company Pinterest. Flipkart, which is worth $3 billion more than SpaceX, saw its funding only increase from $150 million to $360 million between its Series D and Series E rounds. SpaceX's funding, on the other hand, saw staggeringly larger growth over the same rounds, rising 3,233% from $30 million to $1 billion. The company's huge valuation and soaring funding rounds ensure a record-setting debut when it hits the market. How Much Is SpaceX Stock? Because the company is still private, it isn't required to disclose revenue or profit figures. That makes it difficult to predict what the SpaceX stock price would be once it starts trading. SpaceX's status as a private firm allows only Elon Musk, venture capitalists, and the company's employees to own SpaceX stock. People who want a stake in SpaceX have to buy it directly from the employees who already own it. SpaceX's primary revenue source is its contracts with agencies in need of its technology. The most notable of SpaceX's customers is NASA, which inked a $2.6 billion deal with the company back in 2014. The partnership allows SpaceX to send payloads – supply shipments that often include satellites, space probes, and other tools – to the International Space Station (ISS) orbiting the Earth. But SpaceX's backlog – or sales orders that the company is waiting to fulfill – is much larger. The company reportedly has more than 70 rockets ready to transport satellites and other supplies to the ISS and other customers. That means Musk plans on keeping busy in the coming years as he preps more than 70 launches from Cape Canaveral and other locations around the world. Again, SpaceX doesn't disclose many financial details since it's privately held. That means there hasn't been any confirmation of the company's profitability. But analysts from Bloomberg believe the company has turned a profit within the last two years. Their reasoning comes from Musk's frugal strategy to reuse rockets and the company's $4.2 billion worth of contracts with NASA and Alphabet Inc. (Nasdaq: GOOGL). The SpaceX-Alphabet partnership aims to launch hundreds of satellites that provide Internet access to all corners of the globe – an ambitious project that costs a total of $10 billion. When Will SpaceX Stock Be Available to Retail Investors? As a newcomer to this wonderful field. I am very much impressed with your silmplystic but insightful narrative. Sounds good but maybe they will fuse with Tesla?